To celebrate the release of my Harry Potter inspired Hogwarts Quilts, I decide to host a Harry Potter Quilt Along. A Quilt Along is a fun way for us to encourage each other and share our progress on Facebook and Instagram, and keep ourselves on track. Plus you'll be able to ask me questions and get feedback on your work, and there are going to be fun prizes and giveaways along the way. Go to Pieces by Polly Quilts on Etsy and purchase either the Hogwarts Crest 4-House Quilt or the Single Hogwarts Crest Quilt Pattern. You can also purchase both patterns together for a savings here. Quilt Patterns are on sale during the quilt along and the price will increase in August. Go here to fill out the form to sign up or sign up below. Once you have purchased the pattern, signing up for the Quilt Along is free. Follow Pieces by Polly on Facebook and @piecesbypolly on Instagram, so you can be sure to see announcements and keep up-to-date. I'll send out check-in emails too. Check-in on the blog once a week, to enter the giveaway for that week. Share pictures of your fabric choices and quilt progress on Facebook and Instagram with #HarryPotterQuiltAlong2015 and tag @piecesbypolly in your posts, so we can all oohh and ahhhh over your work. Each part of the Quilt Along will have it's own giveaways and prizes...and we'll even include some chances to win if you're not actually joining the quilt along. 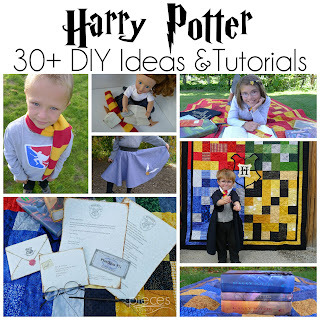 Check-in 1: - Sign-Ups - Harry Potter Fabric Bundle Giveaway - Giveaway winners will get a bundle with 8 - 1/8 yard cuts of my favorite hard-to-find fabrics that I use in my Harry Potter Quilts. These fabrics do NOT have Harry Potter on them...but rather are fabrics that work well for these quilts. One bundle will be guaranteed to go to a Quilt Along participant. The second bundle can go to anyone who has entered (Quilt Along participant or not.) Entries open until July 13th. Check-in 2: Post Your Fabric Choices - $25 Gift Certificate to Pieces by Polly . Post pictures to Facebook or Instagram of the fabrics you're using. 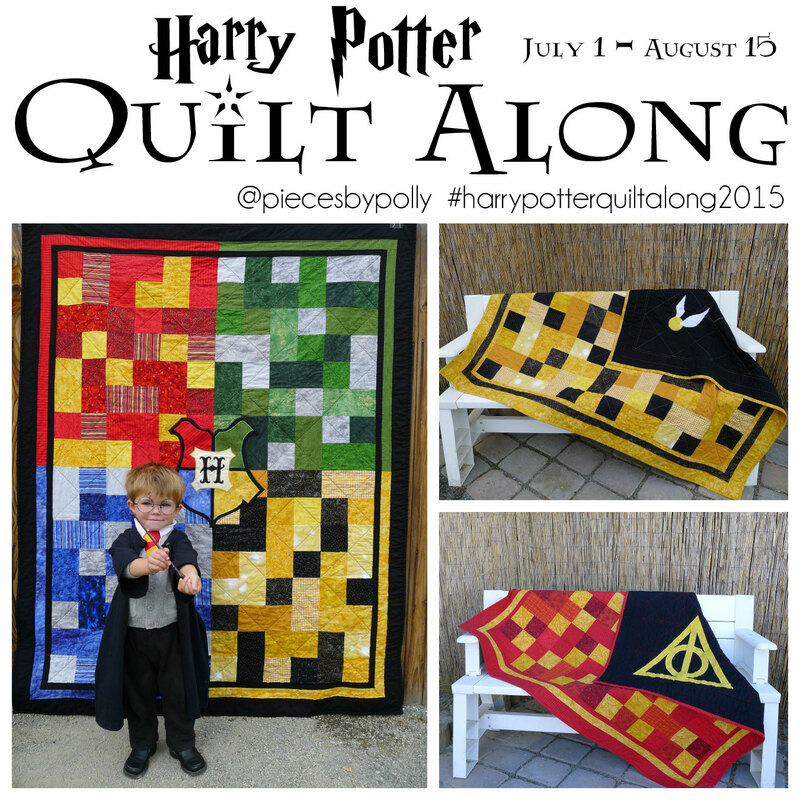 Include #HarryPotterQuiltAlong2015 and tag @piecesbypolly in your posts, so we can all oohh and ahhhh over your choices. Dates: July 13-20th. Check in 4: Finishing Your Quilt Top: Odif Usa 5.6-Ounce 505 Spray and Fix Temporary Fabric Adhesive Giveaway. Dates July 27th - August 3rd. I absolutely love your quilts. I'm not a quilter, but I think that I can handle squares. I think that I'm going to buy your pattern and join you in the quilt along! I've scheduled to share this on Facebook too! I'm in love with your quilt, I like the end result of your work, you're an artist. I stalk you on instagram because I love your quilts so much. I have a lot of sewing experience, but no quilting experience. I've bought the pattern and signed up anyway. Who doesn't love a challenge? Bring it on!